An Indianapolis family says they’ve found dozens of mice in their apartment over the past two months and they don’t believe the complex management is doing enough to fix the problem. 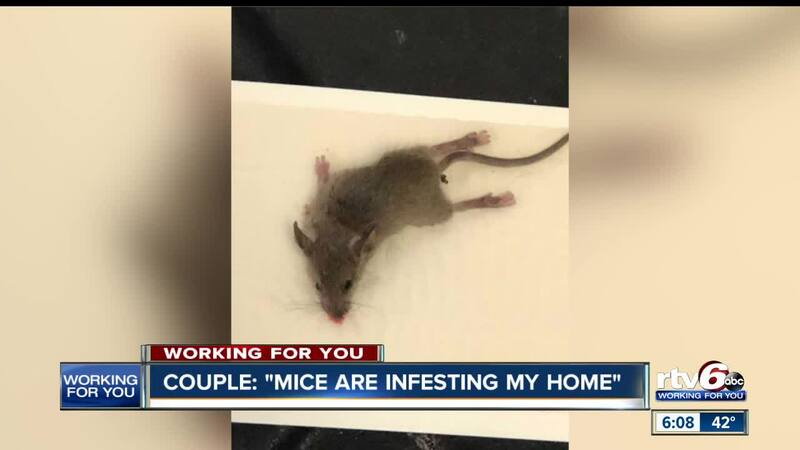 INDIANAPOLIS -- An Indianapolis family says they’ve found dozens of mice in their apartment over the past two months and they don’t believe the complex management is doing enough to fix the problem. Tamara and Thomas Cook have at least a dozen mouse traps set up throughout their home in the Hunt Club Apartments on the city’s northeast side, and they say they’ve caught at least as many mice since September. The couple says they’ve called management several times and the apartment’s maintenance team has set up traps and treated their unit, but the mice keep coming back. Tamara says it isn’t just unsanitary, the problem is also affecting their young daughter. The Marion County Health Department says they’ve issued a housing order to the property owner of the Hunt Club Apartments for several violations - including mice – and repairs like cracks, holes, and deterioration in the walls and near the floor. They say those needed repairs could be where the mice are entering the apartments. 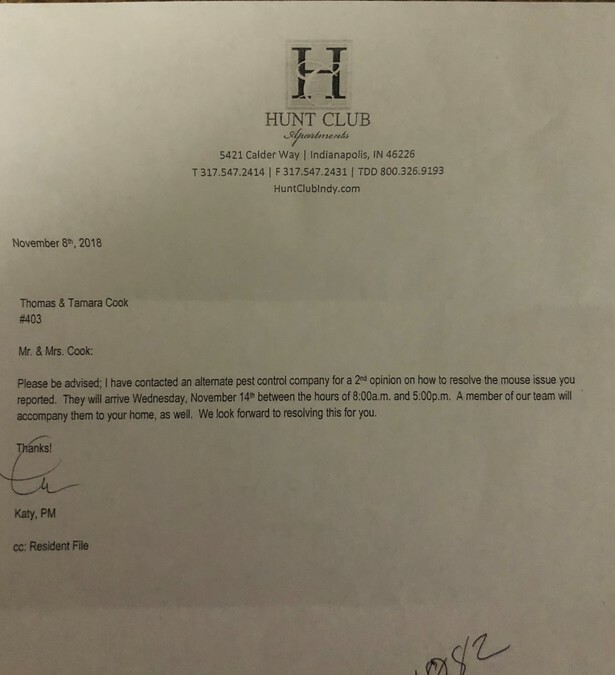 The Cooks aren’t the only ones having issues at the Hunt Club Apartments, records show that at least one other unit was cited for mice, both are scheduled for re-inspection later this month. The company that manages Hunt Club Apartments tells RTV6 they are committed to finding a solution. After speaking with RTV6, the managing company sent a letter to the Cooks saying they had scheduled that appointment for later this month. Thomas tells RTV6 he is happy that they are willing to get a second opinion, but the time frame for that inspection is still unacceptable.